Net Control - Why the Fear? I've never really wanted to be net control, but I assume nobody else really wants to be net control either. It really is a big responsibility. You're essentially a manager that has to control the people that check-in to the net. You essentially own the frequency as long as the net is in session. It can be a friendly net such as talking about computers, ham radios, etc. or it can be a serious net such as a Skywarn Net. We're having some wicked weather and the National Weather Service Storm Prediction Center is calling for some severe weather to come our way. 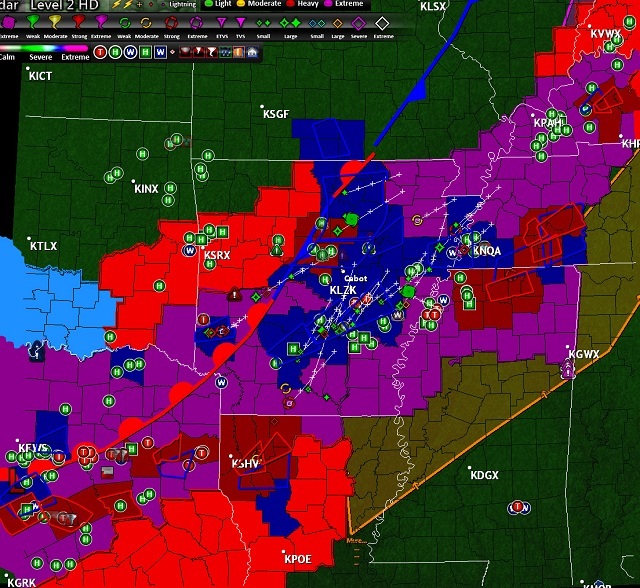 If you're reading this in the future, April 2011 was one of the deadliest months in many years due to sever weather as shown in these GRLevel3 images - if you don't have this software and are a weather buff, it's pretty sweet. This stuff was predicted to come our way. I've checked into a bunch of nets, but now I'm just getting started in running a net. I'd like to see more activity locally when it comes to nets. I think people would enjoy it and even learn some information that they might not know, and even help out their fellow man. I'm a big fan of helping and sharing knowledge when I can. 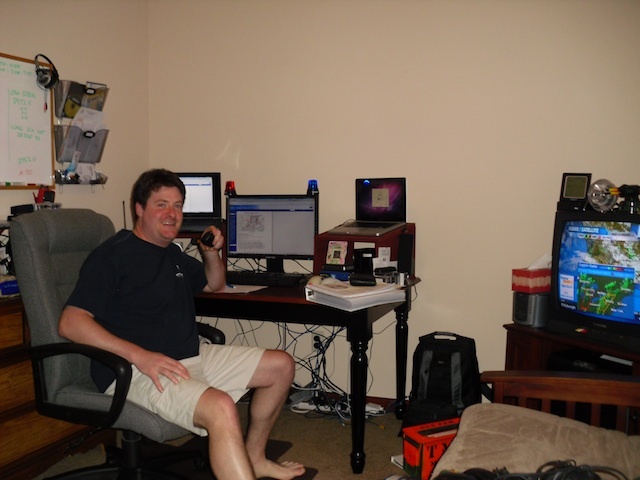 In the following photo, I'm acting as Alternate Net Control for the Lucas County Skywarn Net on 4/26/2011. It looks like I'm having fun. And I am, but I also consider it a BIG, BIG responsibility - so I take it VERY, VERY SERIOUSLY. Here we take information from trained spotters in the field or other radio operators and have direct links to the National Weather Service in Cleveland, Ohio. We can help get them information to SAVE LIVES. I like weather, computers, the Internet and Ham Radio. There's no better place than Skywarn to help out. In this photo, I'm running off of emergency power (two 50 amp hour batteries, a Yaesu FT-8800R VHF/UHF rig, and most importantly - an antenna in the attic). An antenna in the attic? What? Really? Yep. I am entirely off the grid. When the power goes out - I'm good and still operating. When the lightning is threatening - I'm good no exposed antenna. The station is not even grounded to Earth anywhere - that way even if lightning strikes it won't affect my station via typical Earth ground). So I'm in good shape! Dude, seriously, you're in bare feet running the net? You can run a net in your underwear for all I care. As a Net Controller, or even a Station Operating in the Net, just remain professional, and direct the net. There are local television stations, other hams, scanner listeners, public service departments, and even listeners on the Internet now-a-days. Just remain professional and direct the net, record the information reported. You are in charge, so don't be afraid! You live in Wood County, why are you helping a Lucas County Net? Simple, I help where I can. Plus, look at the following map of Wood County and Lucas County - I'm betting (and it's a bet) that a tornado traveling in a north-easterly direction (from southwest to northeast - as is typical***) is going to touch Lucas County somewhere BEFORE Wood County. So I can help Lucas County while also helping Wood County of impending threats. Here's past tornado tracks for over the past 40 years. There are some odd-ball tracks, but typically tornadoes travel in a north-easterly direction***. Do you know why? I do! Most importantly. If you are the first on frequency, help out and assume Net Control Operations. Somebody will always take over for you if you get tired, or worst case scenario, shut it down. It's a hobby after all, and we serve were we can. Most will feel obligated and take the position seriously. There's always time to run a fun informal net. *** Tornadoes typically in my location are known to travel in a northeasterly direction due to upper level jet stream and the rotation of the Earth. This is NOT ALWAYS THE CASE. 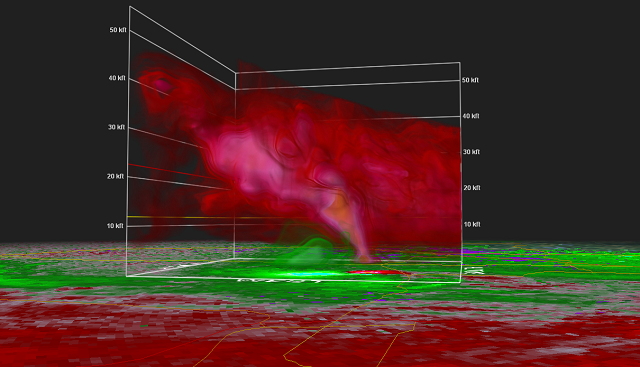 There are VERY DEADLY tornadoes that have traveled in the exact opposite direction. So don't take this as gospel. I'm just hedging my bets that a tornado is going to touch Lucas County first and not take an abrupt turn following the Maumee north to my QTH. So it's entirely an educated guess on my part.